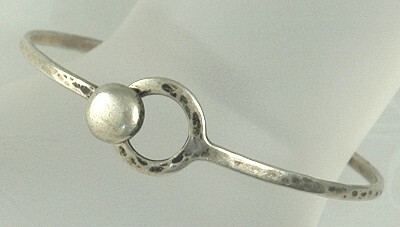 SOLD Hand- made hammered sterling in a continuous circle. The decorative circle is also functional as the latch while the open circle acts as the hook. Signed "Sterling" and "Parker" for Mary Parker a silversmith in the 1950s. An example of Mary Parker's work can be seen in the book Modernist Jewelry, The Wearable Art movement 1930- 1960 by Marbeth Schon on page 257. Condition: Excellent vintage. A beautiful patina has developed in the recesses. Measurements: This is a bracelet that opens and can be slipped over the hand to the wrist. The opening while the bracelet is closed is 2 1/4".